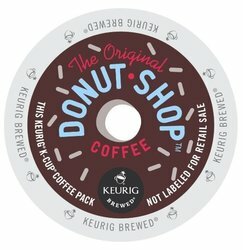 Donut Shop Coffee - Regular K-Cups. Full-bodied, bold and Flavorful, the Regular is, quite simply a cup full of happiness. Each box contains 24 single serve K-Cups for Office Coffee.